Today I want to share with you my FIRST EVER ‘print then cut' file for you Cricut machine. I’ve shared a lot of cut files/SVGs in the past, but this kicks it up to a whole new level. This “Summer” popsicle banner is too cute for words. The files include both the full banner as well as just the popsicles. If you have never used it, the print then cut feature is great for making things like stickers or cards since you can get a tight and accurate cut around the outside of your image. 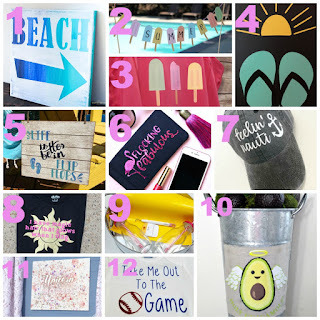 VISIT MY TUTORIAL ON USING CRICUT’S PRINT THEN CUT. If you want to personalize your banner for a birthday or special occasion, I actually have made the ENTIRE alphabet available in my shop. Don't miss this post if you want to cut apart your print and cut file into individual popsicles. I’m definitely ready to kick back poolside for summer. How about you? Love this! Nothing says summer like popsicles!! My sun wants to have an end of school year party and I'm definitely making this banner. This one is the perfect for summer party. Looks lovely and my 6 year old will love it more as she loves candy.